I really enjoy Battleborn, but it’s not doing well. Overshadowed and misunderstood, its popularity is off the low end of most charts. The addition of premium currency to purchase special taunts and skins is exactly not the shot in the arm the game needs. I have a hard enough time trying to convince people that the game is worth playing without the option to spend $1.99 to $49.99 per pack on Platinum, the in-game currency used to purchase special not-just-color-swap skins for all 26 heroes and a selection of premium taunts. “But Overwatch lets you purchase currency and buy skins and taunts!” I will say. “But Overwatch lets you earn the currency by playing as well. Besides, you said to stop comparing Battleborn to Overwatch in the review.” Damn, they’ve got me there. 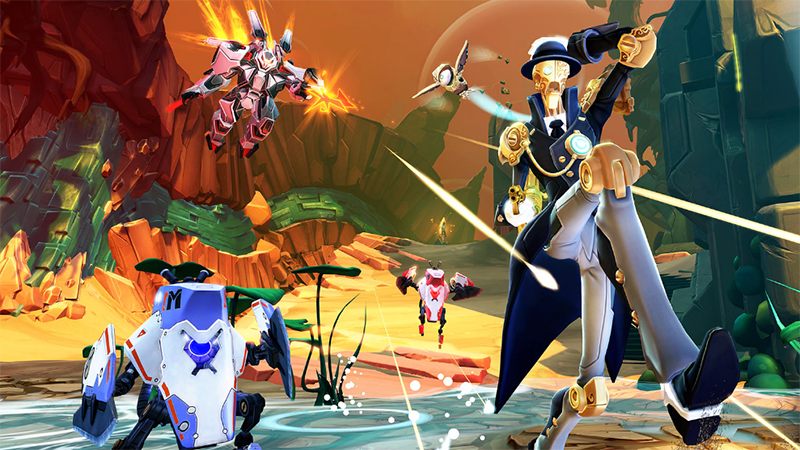 As the post on the Battleborn website lays out, players were warned this was coming. I imagine most of those players have wandered off to do something else by now. They were warned, though. Anyway, skins will cost 420 Platinum, while taunts run 230. A Platinum Pack of 230 runs $1.99, so for a skin you’ll need either two of those or the $4.99 pack of 700, priced as to make it completely stupid to just spend $1.99. Gearbox is currently looking into other non-game-affecting items to sell for cash, from experience boosters to bank spaces and additional loadouts. It really is depressing, liking a game that seems to be going nowhere fast, and then having to share news I know is going to make a segment of the population significantly less likely to play. The Premium Currency update goes live on Thursday, June 16.